Dutch painter, one of the most popular and among the best pupils of the fine painter Gerard Dou. 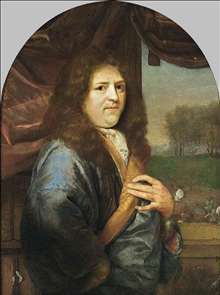 He first studied in Dordrecht with Samuel van Hoogstraten and then with Dou in Leiden. He became the latter s close imitator and won his reputation with candlelight scenes, usually of coquettish young women, done in Dou s manner. 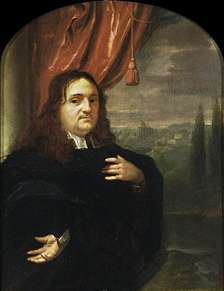 In the 1660s he returned to Dordrecht which remained the centre of his activity until 1691, when he settled in The Hague, a city that offered more opportunities than Dordrecht. He travelled to London in 1692 where he spent six years. During his London sojourn he painted a half-length of William III in armour seen by candlelight. Here Schalcken used his virtuosity at painting candlelight to give added meaning to the portrait. There were visual and emblematic traditions for using a burning candle as a metaphor for a self-sacrificing individual who burns himself out by helping others. 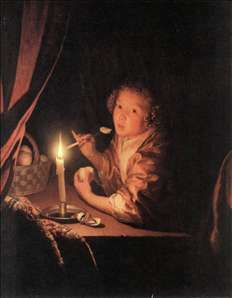 Schalcken was justly proud of his candlelight scenes. When he was contacted by an agent of the Grand Duke Cosimo de Medici for a self-portrait for the duke s gallery of artists portraits he stated that he was skilled in painting both day and night scenes but he would recommend a self-portrait by candlelight. In the event, the duke commissioned one which is still at the Uffizi. The Elector Palatine Johann Wilhelm purchased several of Schalcken s paintings and it seems that the artist accepted the elector s invitation to work for him at his court in Dsseldorf in 1702. After his death Schalcken was eagerly collected; most important picture collections formed during the eighteenth century contained some of his pictures. See more details about "Girl Eating an Apple"
See more details about "Portrait of a Gentleman"
See more details about "Portrait of Matthijs Pompe van Slingelandt"